If, like me, you love writing, you may have noticed that, when you get to a certain point, writing isn’t just about writing (if it ever was in the first place). It starts to eat your life. Ideas come faster than you can write them down, you start to accumulate rejection letters and/or low indie pub sales, and you really start to wonder if it’s worth it. For a while, you can find encouragement through solidarity. Peers who know what you’re going through, because they’re going through it too. But it’s hard to actually find your way forward–mentors on the Internet are a dime a dozen, but good mentors are ones that have mastered the things you want to master, and they’re hard to find, because they’re usually busy doing that thing (or, alternately, they’re not very good teachers, since that’s a whole different skill set). And it’s not just that way with craft. At a certain stage as a writer, you have to start learning writing as a business. You have to deal with taxes, you have to learn to structure your time, to decide which projects are worth taking on. If you self-publish or form your own company, you have to learn about packaging and subsidiary rights. And, while all that’s going on, you still have to find a way to write. The trick to surviving this season of writing is to acquire tools and acquire them fast. And it is in that spirit that I am very VERY proud to be included in the kind of toolbox I wish I’d been able to find when I was first learning writing as a business. The Write Stuff is a craft and business ebook bundle featuring books by writers who are both great teachers AND well-accomplished in their area of expertise. Vonda McIntyre (one of my favorite writers! ), Kristine Kathryn Rusch, Judith Tarr, Doug Smith, Dean Wesley Smith, Chuck Wendig, Bob Meyer, Jerrold Mundis, and myself. 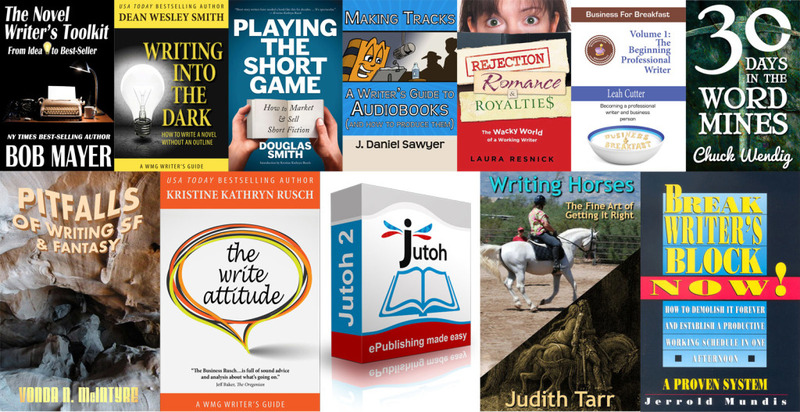 You’ll learn about audiobook production, writing without an outline, writing fast, dealing with publishers, structuring a novel, writing fantasy, structuring your business, and loads, loads more (plus a 40% off coupon for Jutoh, a very well-put-together ebook authoring suite that runs everywhere, including on Linux and Android). If you love writing, if you have dreams of making your voice heard, or even if you’re a little ways down the professional road, you’re going to find a LOT in this bundle you can add to your artistic and professional toolboxes (I’m finding loads in here). Give yourself the price of lunch, and dive in. Grab the tools, use them, and add your voice to the new golden age of fiction. And, if you want to, earmark a portion of the sale price for Girls Write Now or Mighty Writers. Tagged bundles, Business, craft, how-to, making tracks, tutorials, Writing. « New books on the way!